This time we’ll look at building the effector, extruder, and finishing up the build platform. There are five parts that make up the effector and hot-end mount. Begin with the three parts shown below. 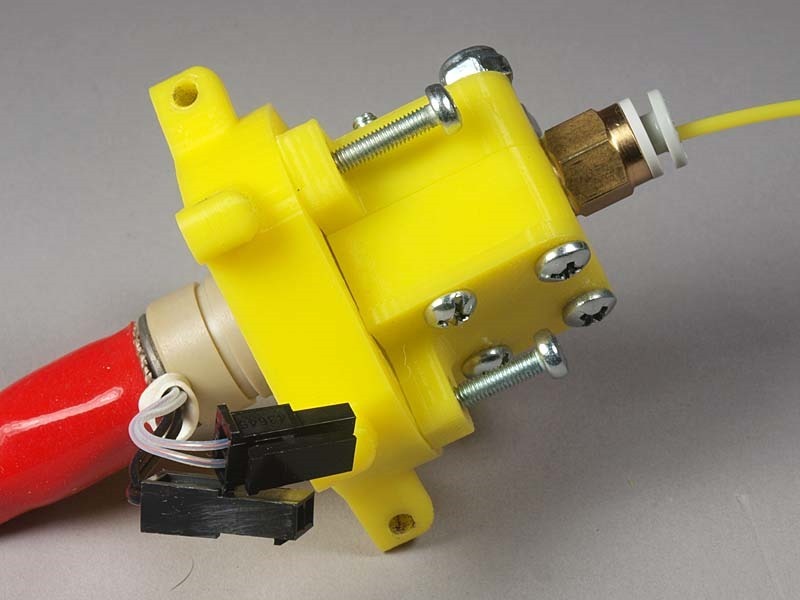 Place the hot end into the slot, and also place the push-fit connector into the smaller slot. These will both be held in place firmly once you have all the screws in place. Next use four 6-24 by 1 inch (or 1 1/4 inch) screws (you could also use M3 x 26 screws) to bold the three parts together as shown. Use Nyloc nuts on the back side to ensure they won’t come lose over time. You should have a gap of a couple of millimeters between the two larger parts before you bolt them. Next, using three M3 x 24 screws, attach the effector to this assembly. Note that the assembly fits onto the effector in only one orientation. 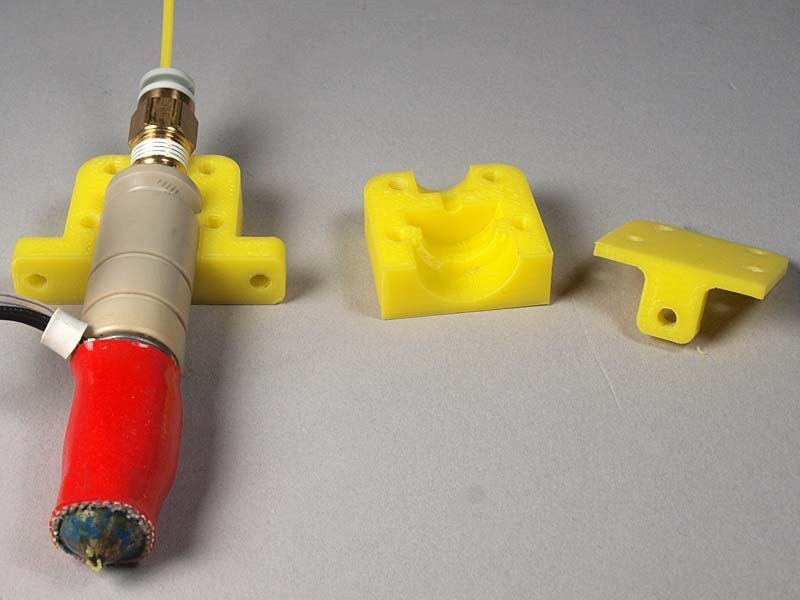 The image below shows the effector before attaching the rods, but you can just as easily install the hot end after installing the effector—it’s easier to photograph before it’s been installed. 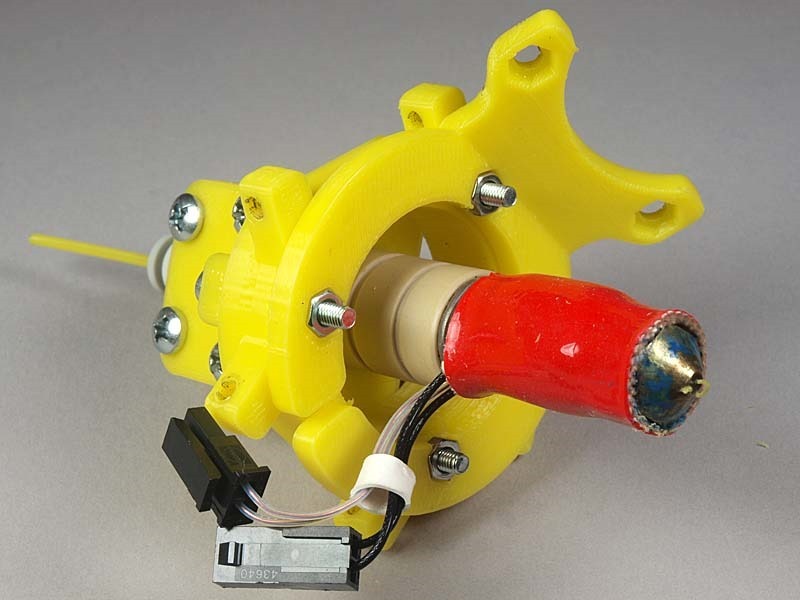 The fan is held in place by two M3 x 12 screws and nuts. 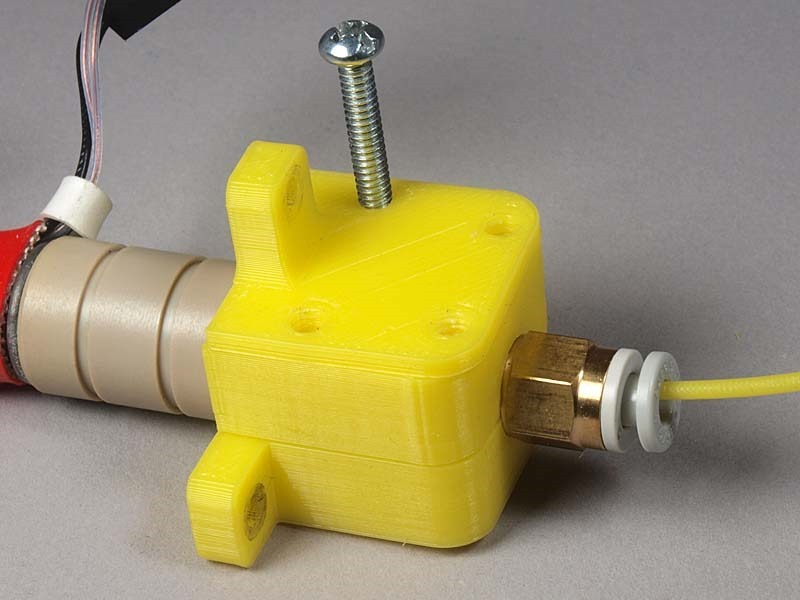 I built the extruder using the files from RichRap’s site, and you can find the links in Part I of my series. The only change I made was to add a spacer, shown in yellow below, to provide more clearance between the larger gear and the carriage. I mounted the extruder so the yellow extension is half way between the top and bottom of the printer. The PTFE tube from the extruder to the hot-end is about 400 mm long, and I put this, as well as the wires (thermistor, heater, and fan) inside a stretch tube to keep things neat and tidy. I also used another stretch tube to run these wires as well as the stepper wires back to the Printrboard mounted under the top of the printer. I found it much easier to manually level the print bed than to get the calibration just right. Some people have suggested that I use the M666 g-code command. I took RichRap’s firmware and plugged in my own numbers, and his version doesn’t have M666 support. So I took a different route. 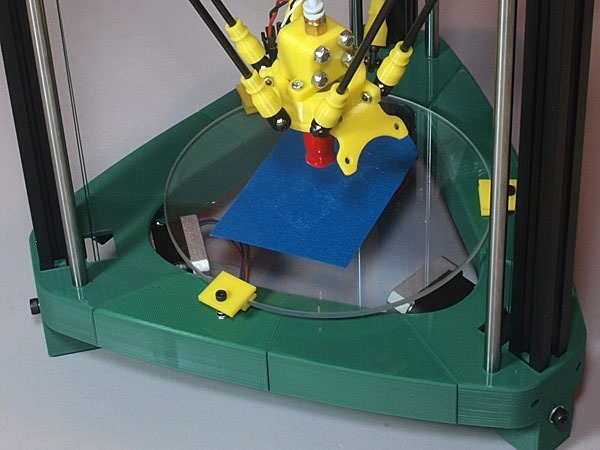 The Printrbot Simple comes with four springs used as part of the bed leveling system. I decided to use the same approach on my printer, so I created these Bed Clips.stl. Insert the M3 x 20 screw through the knob and hold in place with an M3 nut (you can see both in this photo). Then place one of the Printrbot bed-leveling springs under the bed and insert the screw. By the way, the print bed here is a 1/8” thick laser-cut acrylic bed that I’ve been experimenting with in place of the glass. Since it’s not a heated bed, the acrylic works just as well, and doesn’t require the clips. You can find the cut file for this part here: Acrylic Plate.dwg. This filament holder requires two 608ZZ bearings, one M8 x 60 bolt, two M8 washers, and one M8 nut. I thought I might have to create a guide for the filament, but this the filament role turns so easily and smoothly that a guide isn’t required. I must say this works very well, and I’m very happy. Thank you Funkymonk! I’ve updated my previous blog post on firmware settings to reflect the latest design: 3DR “Simple” Delta Printer Firmware Settings. There you’ll find numbers to use for the different firmware settings. RichRap also has a very good tutorial on setting up the firmware: 3DR build tutorial Part4 Firmware.